Happy Halloween everyone! I hope you all have fun plans for the night, whether that’s feeding the neighborhood children a lot of candy, going to a party or watching horror films on the couch. No matter what your plans are, I hope you include making this sweet treat for yourself today! 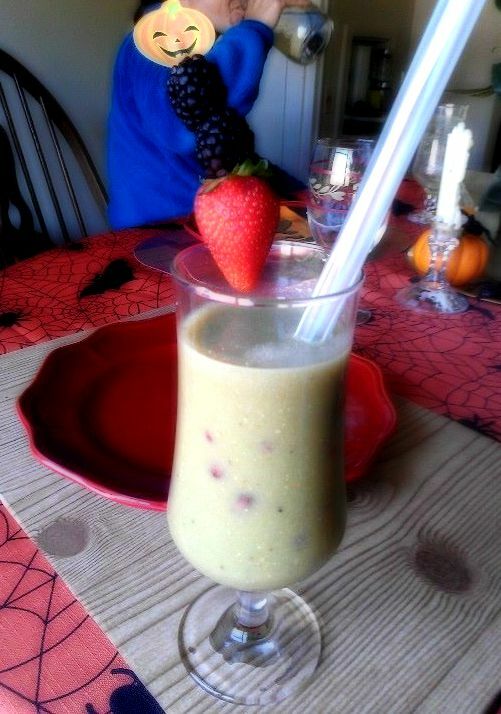 I made this quick juice/smoothie today for a friend and HAD to share it immediately. I didn’t even get any good picture of it other than this shady cell phone picture. But I do not care because it’s that good. Plus I topped it with a pumpkin decoration so it’s perfect to publish today. I seriously do not need any candy after this sweet treat. It has refreshing cucumber, creamy bananas, and crunchy pomegranate for texture. You will not be disappointed. Make now and thank me tomorrow when you are not in the post-Halloween candy downward spiral. Juice celery, cucumber and pears. Add juice to blender with frozen bananas and flax meal and pulse until smooth. Add pomegranate and gently stir to evenly combine. Serve while chilled and top with fruit to garnish.